A powerful masterpiece from the gothic pen of Mary Shelley. Victor Frankenstein is a man of science obsessed with the idea of creating life. So much so, that he creates a giant, human-like being out of a patchwork of corpses. However on achieving his miracle, Frankenstein finds himself horrified at his repulsive creation. His decision to abandon the monster leads to devastating consequences as, rejected and alone, it becomes determined to wreak its vengeance. 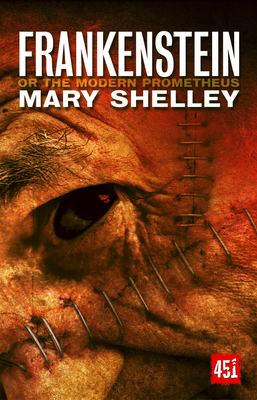 Enraged not only at Frankenstein's betrayal, but also his refusal to give him a bride, the monster hunts down those Frankenstein holds dear, leaving his creator with no choice but to try desperately to destroy the horror he brought forth. FLAME TREE 451: From mystery to crime, supernatural to horror and fantasy to science fiction, Flame Tree 451 offers a healthy diet of werewolves and mechanical men, blood-lusty vampires, dastardly villains, mad scientists, secret worlds, lost civilizations and escapist fantasies. Discover a storehouse of tales gathered specifically for the reader of the fantastic. Each book features a brand new biography and glossary of Literary, Gothic and Victorian terms.